Last meeting between the Huskies and Bulldogs was back in early December in Duluth. SCSU was on a tear with a record of 9-1-2. UMD was trying to put something together after a big win in Minneapolis against the Gophers, but a string of splits in going 6-5-1. The results of the weekend was a Saint Cloud sweep. But arguably UMD had the better game Friday and should have won except for defensive mistakes. The second night was the typical big loss UMD was enduring so far that fall. Fast forward to now. 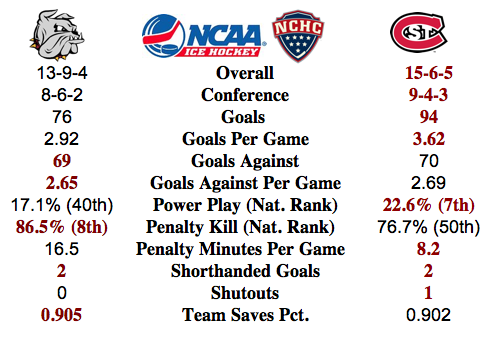 Since their first meeting, SCSU has gone 4-5-3 while the Bulldogs have stepped up with a 7-2-3 record. Currently UMD has second longest unbeaten streak in the nation with 4-0-3 in their last seven games. In the meantime, the UMD and SCSU series this weekend pits the top two teams in the NCHC. The weekend could cement the Huskies as the favorite to win the conference, or the standings could shift to the Bulldogs’ favor. Picks by @afiskness. The race for the Julie and Spencer Penrose Memorial Cup is heated and I expect it to remain bunched through this weekend. Minnesota Duluth @ St. Cloud State: The Bulldogs have been a better team on the road than at home this year and the Huskies defense has shown its weaknesses recently. This is a leveling weekend for the Bulldogs and a split will be all they can get. A slow start for the Bulldogs could mean a no point weekend. Split. Denver @ Nebraska Omaha: This should be a couple great games. They should come down to the special teams. This should be a split. Miami @ North Dakota: The Redhawks season is going the wrong way. They could use a cupcake game to get some confidence back. North Dakota sweep. Western Michigan @ Colorado College: The Tigers looked like a much better team last weekend in Duluth than their record indicated. Having said that I don't think they are playing well enough to get a win this weekend. I expect a couple low scoring games and a Broncos win and a tie.